THURSDAY, Sept. 8, 2016 (HealthDay News) -- Trying to decide whether you can afford the time and money to start an exercise routine? Maybe this will help: A new study finds that the average adult with heart disease who exercises regularly can save $2,500 annually in health care costs. Even healthy people without heart troubles can expect to save about $500 per year by working out regularly, the report found. "The message to the patient is clear: There is no better pill in reducing the risk of disease and health care costs than optimizing physical activity," said study senior author Dr. Khurram Nasir. He directs the High Risk Cardiovascular Disease Clinic at Baptist Health South Florida in Coral Gables. In the study, Nasir's team tracked 2012 data from more than 26,000 Americans aged 18 and older. Nearly one-third of those with heart disease and half of those without heart disease said they met standard guidelines for weekly moderate-to-vigorous exercise. Not unexpectedly, people with heart disease had higher health care costs overall. However, the yearly expenditures for heart patients who also did the recommended amount of exercise averaged $2,500 less, compared to those who did not meet exercise guidelines, the findings showed. Among people with no heart disease and a maximum of just one heart disease risk factor, the average yearly medical costs were about $500 less than for those who didn't exercise, according to the study. The findings were published Sept. 7 in the Journal of the American Heart Association. The bottom line, Nasir explained in a journal news release, is that "even among an established high-risk group such as those diagnosed with heart disease or stroke, those who engaged in regular exercise activities reported a much lower risk of being hospitalized, (having) an emergency room visit and use of prescription medications." The researchers estimated that if just 20 percent of inactive heart disease patients met exercise goals, it could save the United States several billion dollars a year in health care costs. What are recommended levels of exercise? The American Heart Association (AHA) currently advises at least 30 minutes of moderate-intensity aerobic activity five days a week, or at least 25 minutes of vigorous aerobic activity three days a week, or a combination of the two. Moderate exercise includes fast walking, lawn mowing, or heavy cleaning. Vigorous workouts include running or race walking, lap swimming or aerobics. 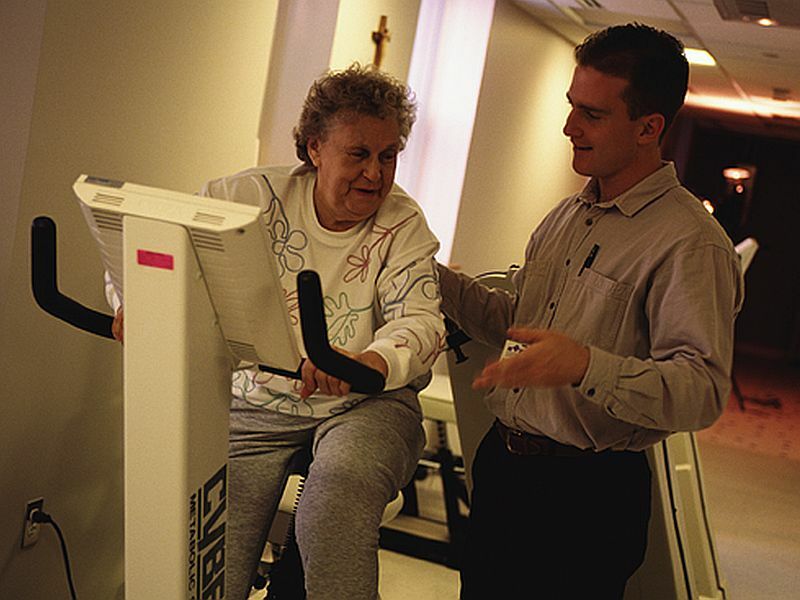 The AHA urges that heart patients first consult with their health care providers to establish their individual exercise goals.